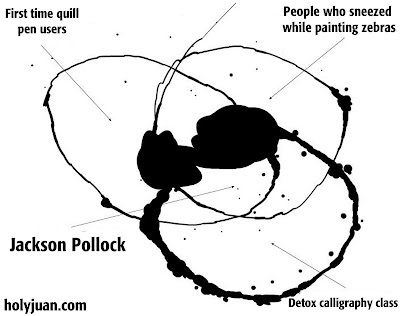 I guess I was assuming that people would know both Jackson Pollock and what a Venn Diagram is. You can't swing a degree from Columbus State without hitting one of them. Do you think it's a coincindence that this Venn Diagram looks like my eggs 'over-easy' attempt? Oh yeah, if your eggs are black in the center, you've got other problems. black egg centers means they're ready for making thousand year old egg soup.